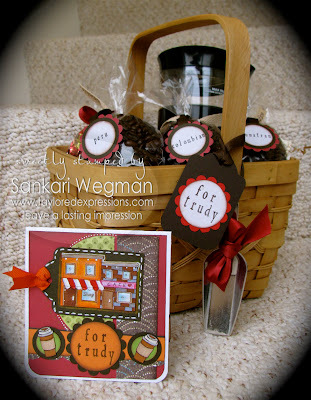 I am psyched to be the hostess this week for the Christmas Stampin' All Year Long blog! So in thinking of what to do for the challenge - I thought that maybe we could try to do a Christmas card or holiday card that is a white on white kind of card - of course its nice to have a little color - but something that is mostly white. So here is my quickie "Let it Snow" card - the two side panels are embossed and the the one in the middle is white with silver embossing (paper company) - it was somehow cooling to make an all white card in June where it is s-w-e-l-t-e-r-i-n-g hot! Ink: Bordering Blue from SU! Hope you have a chance to play along with the challenges - I have to say - I am really psyched to get a handle on the Christmas card thing this year :) woo-hoOO! 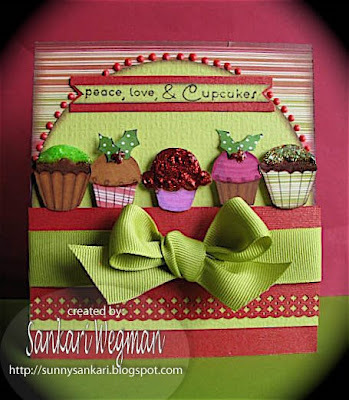 :) Please check out the Christmas Stampin All Year Long blog to see the beautiful works by my teamates and check out the gallery of the sketch for this week over at Paper Craft Planet! Sorry for the quick post - this last week has been quite busy and this week looks like it might be more! Hope you are all doing well! 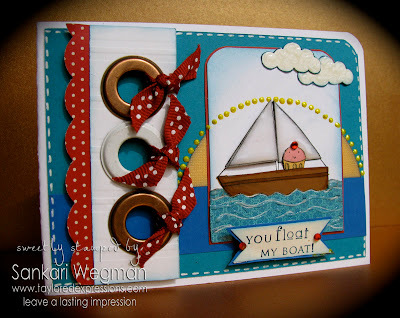 I can't even express to you how utterly -utterly honored and grateful I am that my card from last week was chosen as one of the Top 10 in the Ultimate Card Showdown that Kazan and Laura are hosting over at 2 Sketches 4 You in celebration of the one year anniversary of their blog. A huge thank you to Laura and Kazan, to the wonderful panel of judges, to all my fellow sketch challenge players in all the rounds and to all of you for your encouraging words and sweet comments - it is truly appreciated from the depths of my heart. I was psyched when I saw this sketch that Kazan gave us for the Top 10 round. 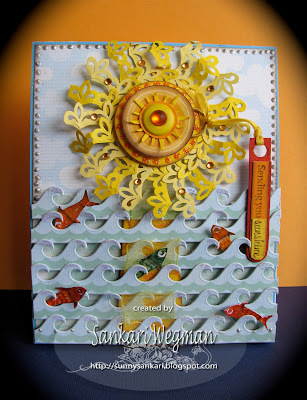 This card is dedicated to all of YOU because you bring sunshine into my life with all of your sweet comments and for coming over to visit - that I wanted to send some sunshine right back to you as a thank you! It is especially dedicated to a good friend of mine "C" ;) - thanks for being my sunshine :). 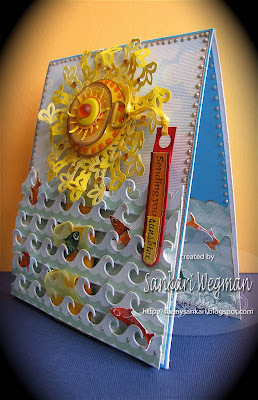 The inside "ocean" is layered and the fishes are jumping in and out of the water too... you can write your message on the space in the top half of the "sky/sun" . Here is a close up picture of the sun and the metal clip that is attached to it from which the sentiment hangs. 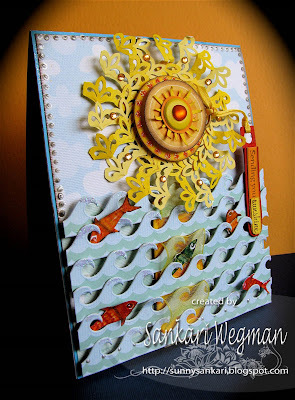 The sun was made with different size circle punches on different colors of orange and yellow papers. The sun rays were made from the Fiskars punch: Fleur de Liis - which also has an embossing function. The rays are alternating dark and light yellow, with little Kaiser blings adorning them. 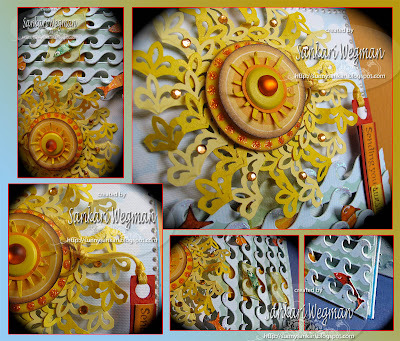 The center of the sun has a star punch from Martha Stewart along with a yellow eyelet and is topped off by a soft bling. The metal loop is also attached to one of the layers of the sun so that the sentiment can hang off it (which is tied to a ribbon). 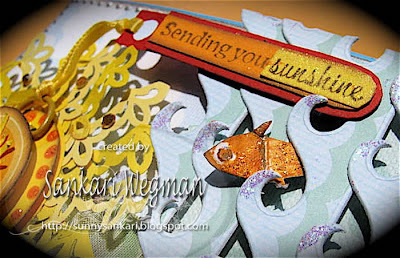 This is a close up shot of the sentiment: "Sending You Sunshine"
I had so much fun making this card - I think that is part of the reason that I love doing these lovely sketch challenges - within the elements of the sketch are infinite possibilities waiting. So, I saw that Julee is having her Verve Sketch challenge (5 sketches) to celebrate her June release of stamps and I had to join - as of yesterday evening, I had planned not to -because of all the things that I have to do - but then I decided last evening that I just had to... I couldn't pass up this challenge :) So here are my 5 cards for the Verve challenge all done in my closet (we are having guests and my craft corner had to come down). Here is the first card from the first Verve sketch that is also doubling as the Mojo MOnday 92 sketch: The stamps set is the Hundred Hearts set from Verve. 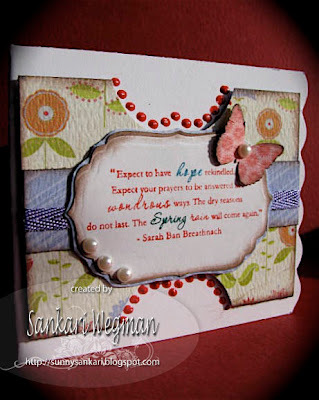 Here is the third card based on the third sketch using the Faith and Hope stamp set from Taylored Expressions and the June 20th Key Ingredients set. 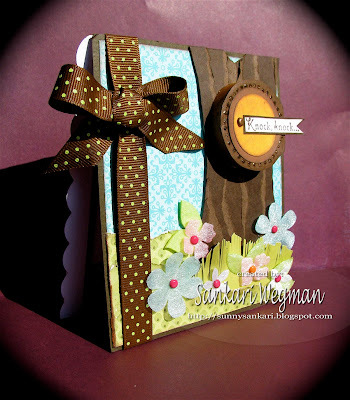 Here is the fourth card based on the fourth sketch and it uses the Wishful Elegance flower from Verve, the June 20th Key Ingredients and a button from the Summer Bag o Buttons from Taylored Expressions. Well, I am psyched to have finished all five - and now am going to clean up the scraps from my closet floor :) and also go and make a chiropractic appointment for my back after all this closet scrapping! Well, I am off to get my laptop repaired - it has crashed and it looks like my harddrive is gone... :( so I am going to go and show it to someone to help me (heLp!!) I am using my DH's to type this.....So for all of you reading this - make sure you back up your stuff on your computer! I even had a MAC and it crashed.. ugh! <--- that is the pit in my stomach... hopefully something can be salvaged! Wish me luck on salvaging something from my laptop! 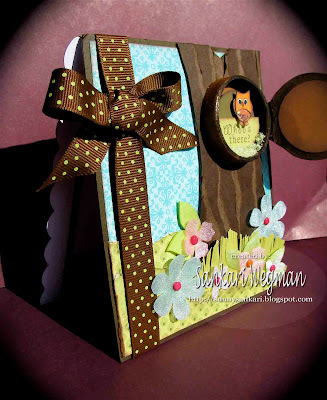 I had alot of fun creating this fun little gift set in my closet last and here is a sneak peek of a part of a gift set that I made for the Stamp a Sweet Impression blog. You guys are the real sunshine! So Guess what? I no longer have a craft corner as we had to take it down to make room for my family that will be coming to visit - so I am without my craft table and everything is in boxes! So now in order to make a card, I pick through boxes to find things and craft on the floor! 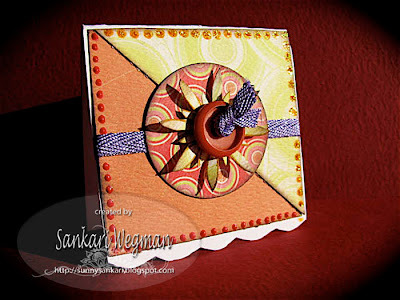 Maybe I should change the name of my blog to be Sankari's Sunshine Floor.... umm... noooo :)! I actually cleaned up a little bit and threw things out, gave things away which feels good! Who knew I was such a pack rat? 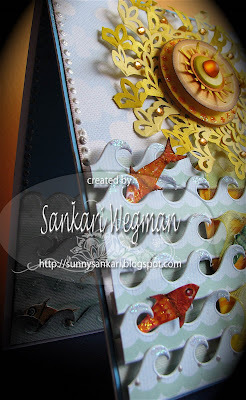 But anyhow, these next two weeks - I will be crafting from boxes - so who know what might get created! 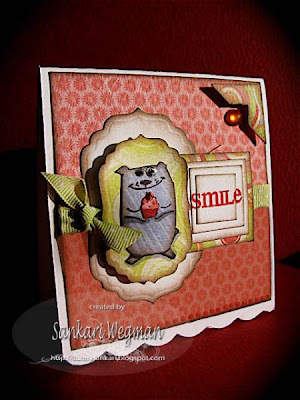 Anyhooo, Today is Monday and that means a challenge from the Christmas Stamping All Year Long Group! Today Maria's challenge was to go nuts and make a Holiday card with whatever you would like to :) She even provided a sketch for us that I love and kinda followed. 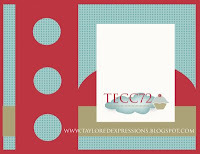 I used For the Love of Cupcakes stamps to create my card along with the Season's Sweetings sentiment both from Taylored Expressions. 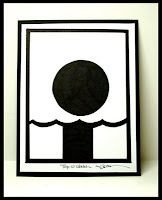 Ink: Chocolate Chip! by SU! Accessories: EK Success punch, ribbon from stash, Fire Engine Glitter from Taylored Expressions, dimensionals, candy cane stickles and eucalyptus stickles. I had so much fun coloring these cupcakes and since it is SO hot and does NOT feel like Christmas at all! 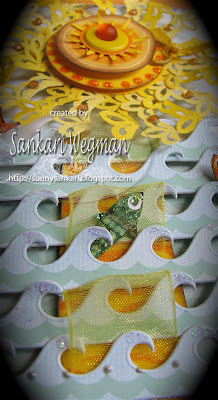 I threw on some holiday jingles in the CD player and it was fun :) Hope that you will join us and create a holiday card! Check out the beautiful cards from my fellow teammates over at the Christmas Stampin All Year Long blog! I have to say that I am a HUGE fan of the papers that Taylor has over at Taylored Expressions. 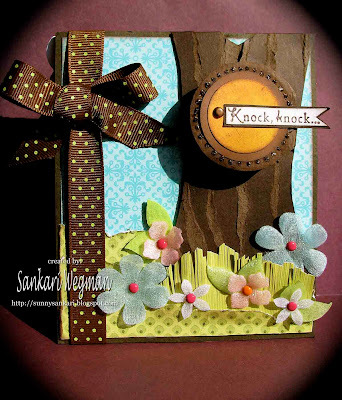 Every month, Taylor puts together fabulous kits (called Key Ingredients) where she combines cardstock, coordinating Designer Paper, Embellishments and Ribbon all into one set! Today half of the Baker's Design Team are featuring this month's wonderful kit: the June 20th Key Ingredients! woo-hoo! 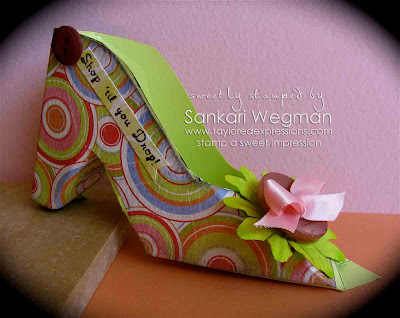 I used the template from the 3D12 challenge from PaperCraft Planet for this shoe from a few weeks ago and paired it with the DownTown Diva set from Taylored Expressions - a perfect fit! And don't forget to stop in at Taylored Expressions and see all the deals and steals that she has going on!!! Taylor is moving and has some fabulous products on SALE !!!! Also check out the Info on Taylor's Blog about how to become a Key Ingredients Subscriber! Seriously it is an AWESOME steal of a deal! 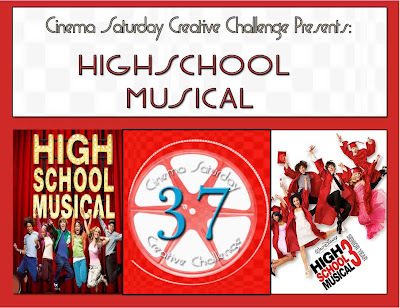 This week over at the Cinema Saturday Creative Challenge - we are featuring the movie: High School Musical (you can pick any of the three that are out to make your card - every saturday we pick a movie from which to create a card etc.) and the challenge requirement for this movie was to create a card with school font lettering or numbers (or both). Okay so I have to admit - I saw High School Musical last night - and then made my card right after! For some reason - I was trying to avoid seeing this movie - I don't know it felt so teenager-ish and I felt suddenly "old" - but I have to say it was a fun viewing and I can totally see why this movie is a hit - fun songs - hip actors - (and finally now I know who Zac Ephron is who all my little nieces have a crush on!). Well - I had alot of fun playing and hope that you have a chance to join us over at Cinema Saturday for some High School Musical fun!!! See you at the movies ! I am sorry that everything is so quick - I would love to play with these colors more if I have a chance. We are going to be having a lot of visitors coming in this weekend for the next two weeks - so I off I go back to those piles of laundry that I keep trying to ignore :) lol! Thanks so much for visiting my little corner!! Before I get to my card - I just wanted to say a big thank you to Laura and Kazan and the wonderful judges and to all of you who left such sweet comments! Thank You So Much!!!! Thank you for allowing me to be part of the Top 20 in the Ultimate Card Showdown that Laura and Kazan are holding to celebrate their first blogaversary over at 2 Sketches 4 You! I am so honored to be part of this amazing event and to be surrounded with such talented artistes from around the world! A big Thank you to you all!! 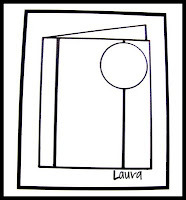 This week Laura gave us a wonderful sketch - there were so many possibilites that I didn't know which way to go. 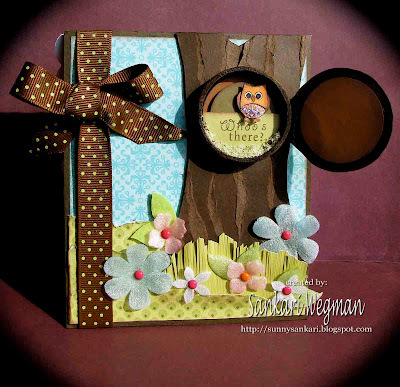 I love how from one sketch there are endless possibilites for making cards :) I wanted to make a fun little scene and used the circle element as a little owl's home in a tree that could open and close (I have been watching the Adventures of Winne the Pooh with my 4 year old son :) . I was so excited when the ribbon spool that I had actually measured 1 3/4" the same as my punch! 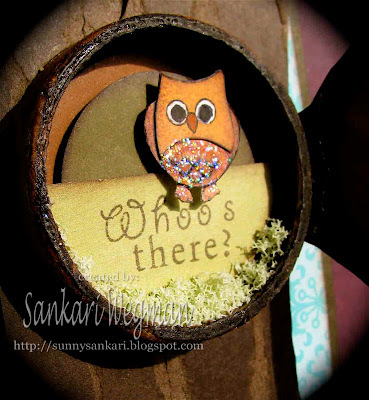 I added some green flower soft to the inside of my little owl's nest for a more nest-y-ish sort of look. 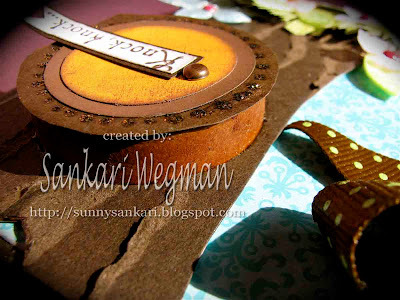 Card Details: Paper: K&Company (for the green and blue DP) and the rest from stash Ink: Chocolate Chip SU! and Martha Stewart brown, Stamps: Branching Out Accessories Accessories: flowers from the Mother’s Day KI, brads, ribbon spool for the knot hole, 1 3/4 circle punch SU!, 1 1/2 circle punch CM, 1 inch circle punch SM, Diamond Stickles, Flower Soft, white gel pen, corner rounder, dimensionals, button from stash. I had alot of fun making this card - and I can't wait to see what wonderful creations have been created with this lovely sketch! A big thank you to Laura, Kazan and lovely judges and all of you and big hugs and thanks to all of my fellow showdown participants – it is a total honor to be with you! Are you ready for some hopping? Blog Hopping that is? 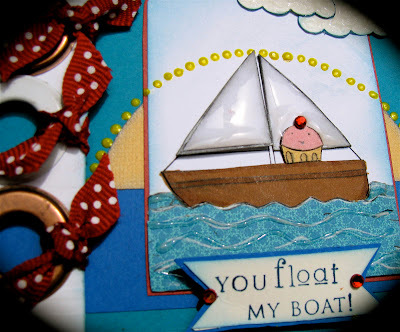 Well, I am so excited to be part of a Just Rite stamps blog hop that Taylor VanBruggen has organized! 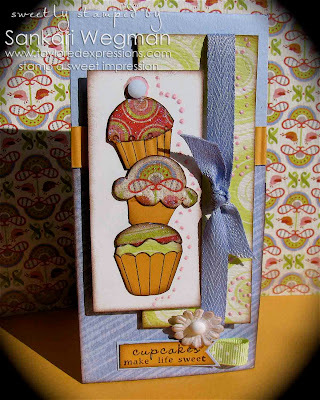 You probably know the wonderful Stamp a Sweet Impression line, the Whimsical Wishes line and the Lasting Impression stamp line that Taylor has in her store - but she also has a ton of Just Rite stamps too! I have been totally fascinated by the Just Rite system after seeing some of Taylor's wonderful projects and totally loved that you can create your own stamps with this system - from Monograms, to Wedding/Baby announcements to taylored ;) gift ideas! 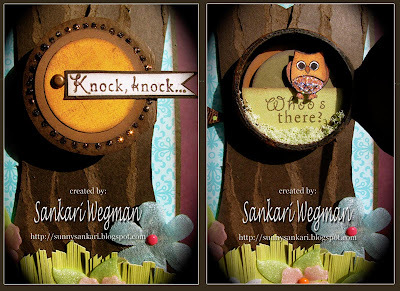 And speaking of gift ideas - here are two projects that I made with this fun stamp system! 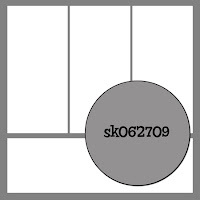 Project Details: Paper: from the March KI and green from K and Company Ink: Chocolate Chip from SU! 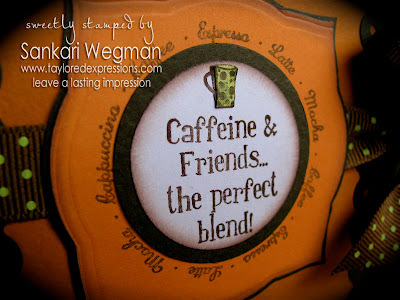 Stamps: JUst Rite Caffeine Centers and Borders Accessoresi: Ribbon stash, sponger threading punch from fiskars, spellbinders, circle punches from SU and CM. 2. The second project is a little coffee basket goodies for my MIL! My Mother -in -law (MIL) loves a cuppa in the morning! 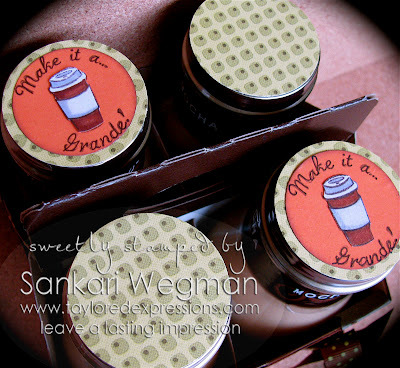 And I wanted to give her a little fun sampler pack to use in her daily morning coffee routine so that she can decide which ones she likes the best - also added in a little coffee grinder, a scoop (on the ribbon for some accent) and also a sample of some chocolate covered treats. 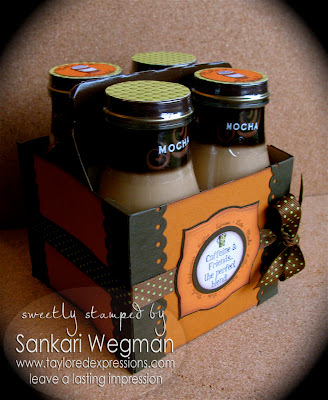 WHo doesn't like a little treat with their morning java? 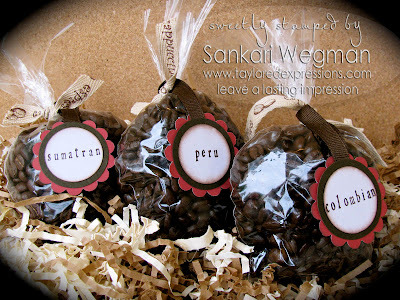 I used the Times Roman font that the Just Rite system has (to see more font options - check out this link here) and spelled out the different kinds of coffee - this is just a little sampler pack - so its just enough for a cup of java and to figure out which one she likes to have more of :) . 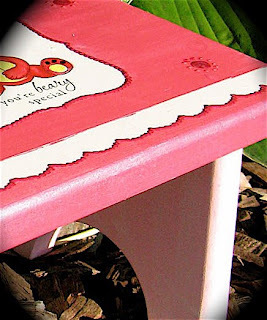 and also to stamp a little tag for her with the sentiment: for Trudy attached to a little scoop - I LOVE this little scoop - I love making this personalized! Stamps: From both the Downtown Diva stamp set and the Just Rite stamps Caffeine Centers and Borders. PS - check out the Beary Special Holiday Bear card that I made earlier today by scrolling down! hugs! 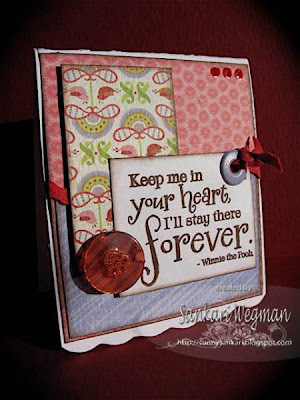 Its Monday and that means its time for another holiday card challenge from the Christmas Stampin All Year Long Blog and the challenge today comes from Debbie who challenged us to use our eyelets! I always forget what a fun embellishment eyelets are - and I wanted to share that ALL the eyelets on my card were hammered in by my son who is four (I thought for sure he was going to hammer my fingers - but he did a good job with them eyelets! ! He calls them eyeballs though :) (my favorite thing he said was - "I think we need to put more eyeballs on your card" :) ha! I had a lot of fun making this card and feel so happy to be part of this awesome blog where we knock one more holiday card off our "to-do" list so that we can enjoy the holidays without the pressure to make a zillion christmas cards two days before the 25th - (yes - that is what happened to me this year - and I am psyched that halfway through this year - I have a nice stack of holiday cards ready! yay!) I am never this organized! Ink: MOre Mustard from SU! Accessories: Ribbon from K & Company, eyelets from stash, spellbinders dies, corner rounder, sponger, dimensionals, vellum, gold stickles for halo and platinum stickles for ears, Kaiser Rhinestones, Crystal Effects. Show watched while crafting: The Agatha Christie Hour on Youtube - I am HOOKED! This is one of my favorite images from Taylor's new stamp release Beary Special from Taylored Expressions - and I have to say - that I have been itching to make a holiday bear card as soon as I saw this set. I paper pieced his little teddy pear paws and after adding some stickles to ear and halo - I also added some crystal effects to nose and eyes and couldn't help adding some to the paws - man that stuff is addictive!! If you have a chance to play along with us that would be awesome!! 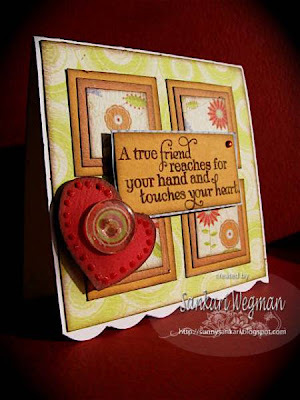 Its really a great motivating factor every week to be part of a holiday stamping group through the year! Check out the rest of the awesome merry and bright creations at the Christmas Stampin All Year Long blog!! Thank you all for visiting my blog!!! Stop by later as I have another post with some special treats coming up later! 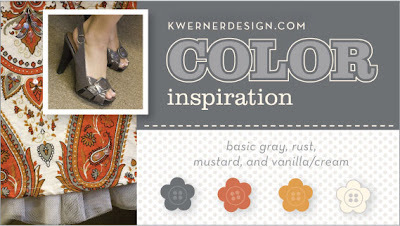 I was so psyched to have a chance in Kristina's Color Inspiration Challenge #54 this week - look at these awesome colors together! It looks like summer fun! 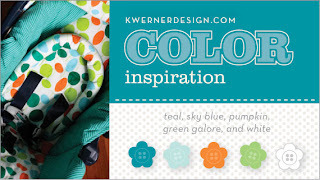 She got the inspiration for these colors from a fabric for a carseat from her friend Adrienne- wow - wish we had a fun carseat covers like this - instead of Graco gray! 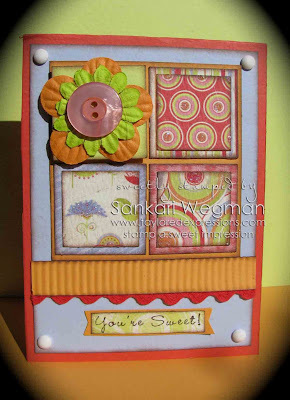 For this card - I used Julee's Sketch challenge #90 and her new stamps for this card. 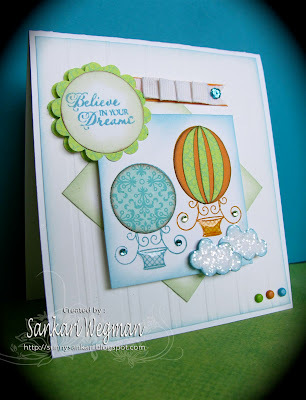 I love this set and paper pieced the balloons with different DP. 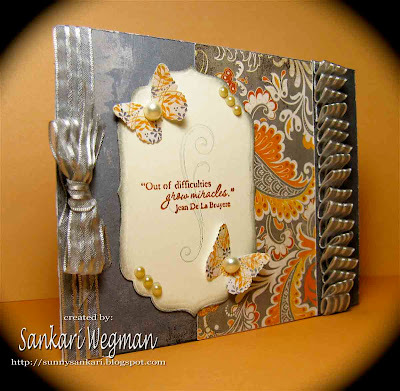 I tried to keep most of the card white and just have bits of color - can you believe its a card sans liquid pearls? I tried to keep it clean and simple. There is some crystal effects on the baskets of the balloons and also some on the clouds along with some coarse glitter. I had a lot of fun making this card and using up some DP from my stash that seems to actually increase in size and not decrease no matter how much I try to use it up! Ink: Taken With Teal from SU! Well, I am about to go plunge into the exciting world of laundry and sunday pick up now - yes - I know - its a very glamorous life! Hope you are all having a fabu sunday! 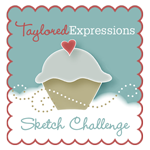 Taylored Expressions JUNE Release DAY!!! 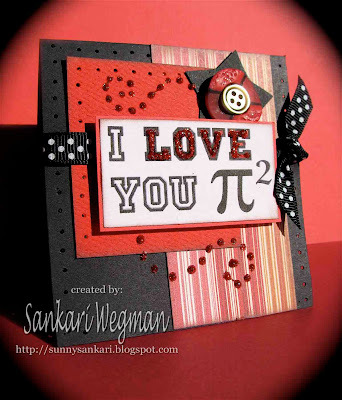 Create a Holiday Card with Numbers!